When Porsche's head of research and development uses the words, "uncompromising sportscar" and "race track experience" you expect him to unveil a 911 GT3, but these words introduced the new Panamera GTS. When Porsche's head of research and development, Wolfgang Hatz, uses the words, "uncompromising sportscar" and "race track experience" you expect him to unveil a 911 GT3, but these were the word he used to introduce the new Panamera GTS - one of the few genuine world premiers at an otherwise dull Los Angeles Auto Show. Why you'd want to drive a near two-tonne limo on a race track is not easy to answer. However, the Panamera is not the craziest Porsche to wear the GTS tag that's was first worn by a Zuffenhausen product in 1963 (904 GTS). Nope that title belongs to the 2008 Cayenne GTS. 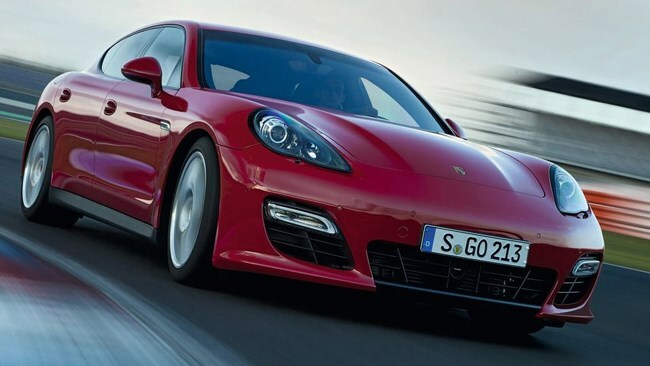 Like the Cayenne GTS, the Panamera runs a 4.8-litre naturally-aspirated V8. Power is up 22kW with a peak of 316kW at 6700rpm - 200rpm higher. Torque jumps 20Nm to 520Nm at 3500rpm and the engine now revs to 7100rpm - 400rpm higher than the Panamera 4 and 4S. With these big numbers lurking under the bonnet, it's no surprise the big bus runs hard. Launch control gets the seven-speed PDK-only GTS to 100km/h in 4.5 seconds and on to a top speed of 288km/h. Despite the hike in performance the fuel consumption isn't absurd at 10.9L/100km in European combined cycle testing. Sitting on air springs, the GTS sits 10mm lower than the regular Panamera and rides on 19-inch Panamera Turbo alloys. On sale in March next year for $315,300, the Panamera GTS may be a strange but fast addition to a track day near you.